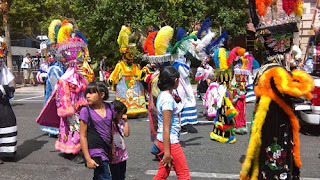 The Helldorado Days festival is a 3 day event which encompasses the old western spirit of Nevada and its frontier roots. Beginning in 1934, shortly following the economic boom of the building of the Hoover Dam, sponsored by the local Elk's Lodge No.1468 and supported by the Las Vegas Chamber of Commerce, the Helldorado Days events were created as a means of maintaining state pride and attracting tourists to the area for more of a family friendly shindig than the usual rowdy gambling halls and saloons. The festival includes a rodeo with bull-riding, team roping and barrel racing; show horses, art shows; beauty contest, and the famous Whiskerino contest, in which gents from all bow-legged walks of life spend months growing grizzly whiskers to win the state's best beard or mustache and of course -the Helldorado Days' parade. 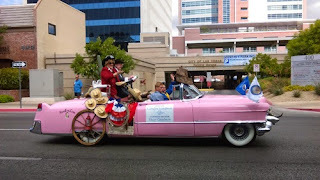 who rode down 4th street a top a vintage pink Cadillac convertible strun with western motif. 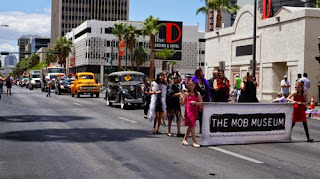 The processional headed north on 4th street from Gass Avenue and rounded up at Stewart Ave, downtown, and included a variety of businesses, non-profit organizations such as the Boys and Girls Club, political groups; the Las Vegas fire department and metropolitan police department, dance groups of all ages and ethnicities; marching bands, entertainers such as comedian +Paul Scally. 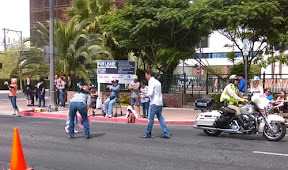 The 2015 event donated proceeds to local charitable groups such as the Animal Foundation, Boys and Girls Club of Southern Nevada, Shade Tree Shelter and Project 150!. Folks were also given a discount for bringing donated items to the door of any Helldorado Days event. With all this community involvement and charity work the Wild West is truly a force to be reckoned with, in defending the trailblazers and onward road of the Silver State.